We have often talked about how there are many advantages to creating an Advanced report. However, as a bit of a recap and to explain why their potential we should we’d recap the main features as a “Power User Tip” so you have all the main information in one area. You can see all the backlink information to any given site; get a little extra such as TLD’s, IP address and Subnet information. However, one of the most useful aspects of the Advanced reports are the Analysis Options. 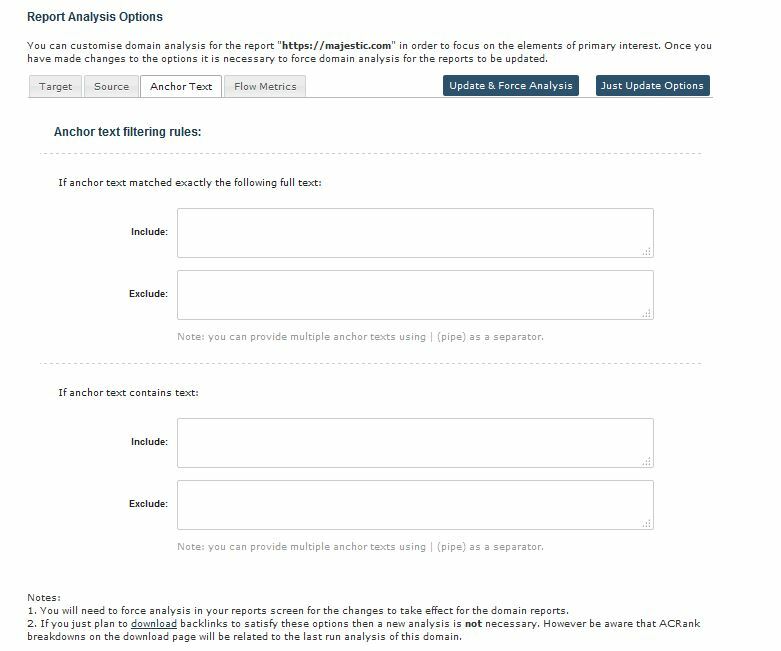 These options are some extra filtering options that really help you drill down into your data that bit further, helping you get the information that you really need. 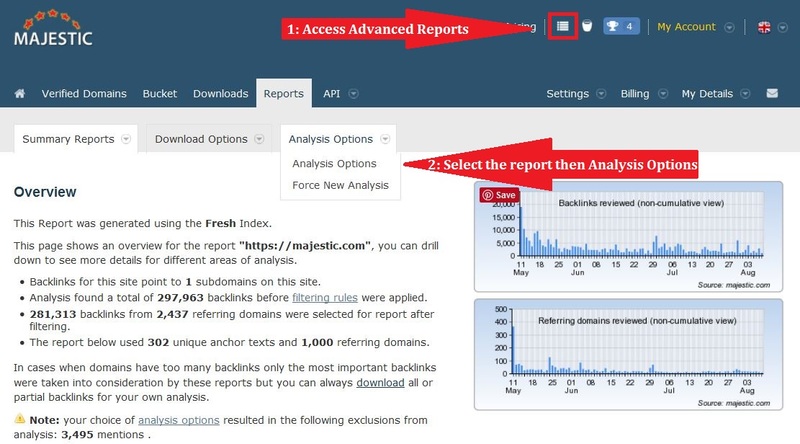 To access these filters look to the top of your report for Analysis Options. In the first tab we find ‘Target’. 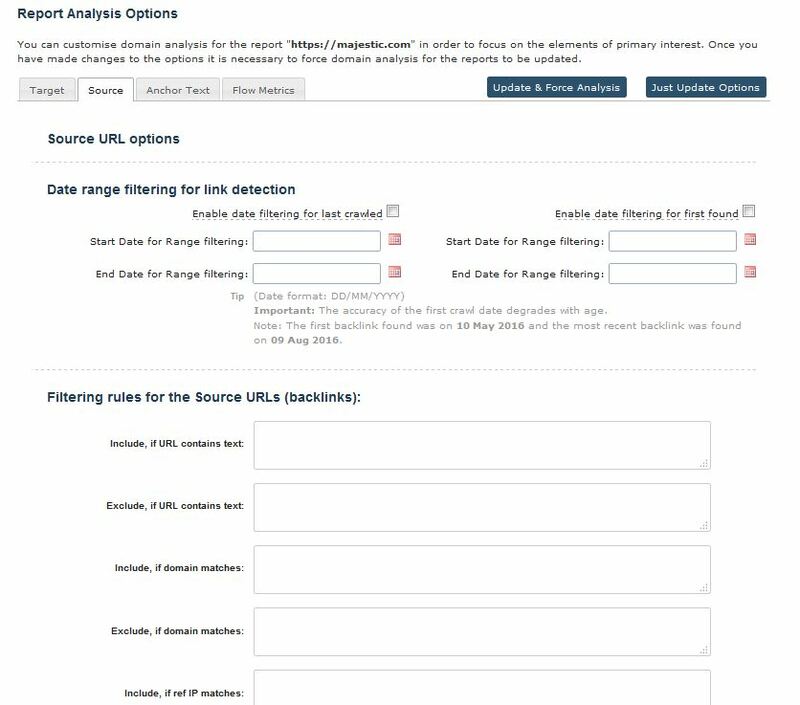 Here you can limit the report to one, (or a few), target URLs, say a specific page on your site or a competitors that caught your eye. Not only that, you can analyse all pages either ‘including’ or ‘excluding’ a specific key word. For example, you may wish to just look at your ‘blog’ pages. We also give you the option to just look at homepages of a site by checking the appropriate box. The second tab, Source, has a few more options for you to play around with. At the top of the page you have the ability to filter to a specific date range. Did you spot that the month of May was particularly busy? Just easily input the dates and voila, all the information that you need in one report without having to figure out when you received these links. *TIP* focus on a particular year by creating your report using the Historic Index. Further down the page, we give you a few options to ‘include’ or ‘exclude’ specific URLs, Domain, referring IPs, geo country and TLDs. Meaning that you can drill down into the data even further. Let’s say for example you noticed that the Huffington post was linking to your site and you wish to know all the links from it and where they are linking to. Easily input the name in the ‘Include Domain’ box, you can focus on one specific, or a few, by inputting a comma. All the data then presented to you within the report, will surround the Huffington Post information only. *TIP* you can use the exclude boxes for those pesky disavowed links and take a look at your new clean link profile within the reports. 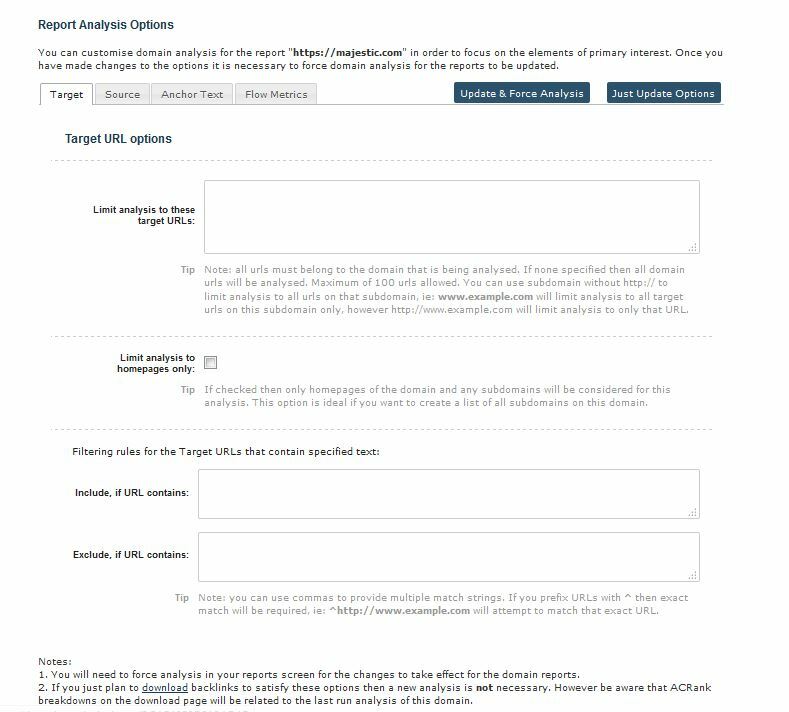 Advanced Reports automatically exclude the No Follows, Deleted, Alt Text and Mentions from creation of the report. These exclusions can be removed at the bottom of the Source Tab. You are presented with a few more options such as Image, Redirect and Frames, giving you the flexibility to focus on a certain type of link. *TIP* Want to find some possible new link prospects? ‘Include’ just the ‘Mentions’, and this will show you where on the web your website name has been mentioned, but where there is not necessarily a link to your site as of yet. This type of report is most useful if you have created a Root Domain Advanced report – the mentions will then be looking for ‘domain.com’. The following tab ‘Anchor Text’ again allows you to include or exclude certain anchor text being used to link to your site. This can be a single word or phrase. You may wish to exclude all the anchor text with www. or your brand name, for example. 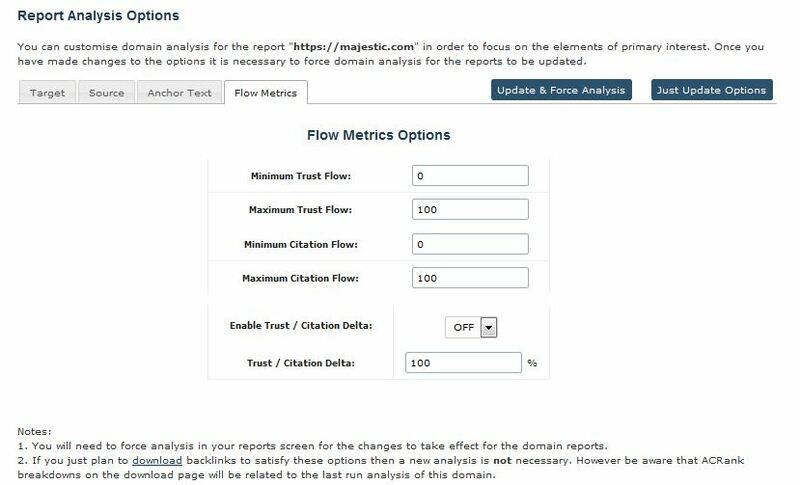 The final tab surrounds the ‘Flow Metrics’, allowing you to filter to a specific score that your links have been receiving. The Advanced Option of Trust/Citation Delta is an easy way to look at a specific sub set of data. For example, if you were to set this at Max 50% then all the links shown will have a score that is maximum 50% difference in scores. If you were to change it to Min 50%, the links shown will be above 50% difference. *TIP* Suspicious links that link to your site generally have a low Trust flow but high Citation flow score. Put the Trust/Citation Delta at Max 50% to see the links that are most likely to be suspicious all in one report. 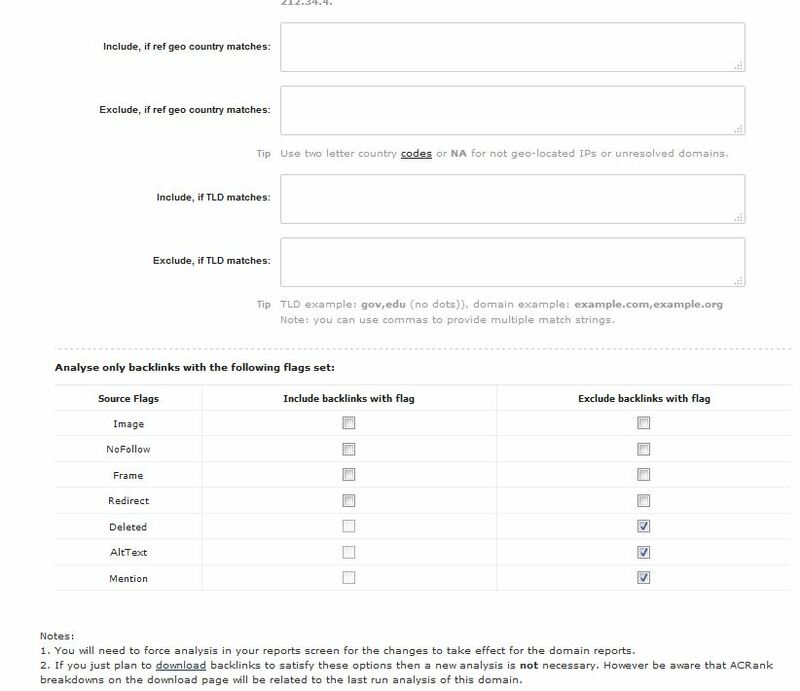 One thing I did notice that tripped me up was that the options under "Analyse only backlinks with the following flags set" are mutually exclusive – you can either include links, or exclude links, but not both at the same time. Otherwise – great tool. It’s Majestic at it’s most powerful! If you keep both those options OFF then you get both at the same time. The Include and Exclude override the default assumption that you want all the links.